There are many ways to explore canyons and on a recent August day we ventured between the shear sandstone walls of East Clear Creek. This time our explorations were not by foot and without ropes or harnesses. The objective of the day was to not ascend or descend a canyon but to find some fun and challenging climbing lines from the canyon bottom up those precipitous canyon cliffs. You may be thinking, “Did you not just mention that you left the ropes and harnesses at home.” That is correct. On this adventure we delved into the sport of deep water soloing. 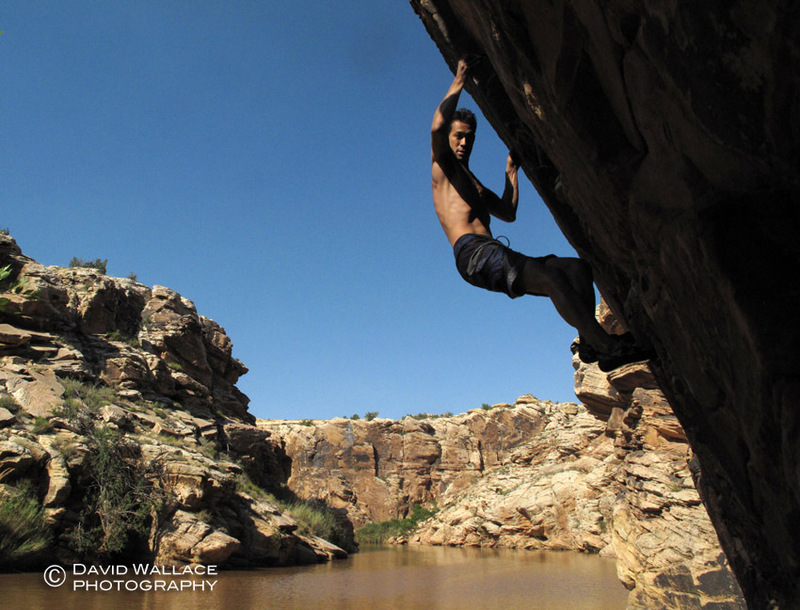 Deep water soloing is a discipline of rock climbing where an individual climbs vertical or overhanging walls over deep bodies of water so if the climber falls the water protects them from injury. The sport is most famously practiced on sea walls, cliffs and towers over the ocean at high tide, but we found ourselves climbing above the brown silty waters from monsoon runoff backed up from the dam downstream in the East Clear Creek reservoir. We placed our inflatable rafts (not much more than pool toys) into the chocolaty waters of the reservoir and paddled upstream past an abundance of graffiti as the canyon walls tightened. After several miles Mike spotted some fun warm up lines so we docked our boats, swam under the blazing sun to the start of the climb. We dove down a few times to make sure the water was deep enough and that there was no debris in the fall zone of this water that had zero visibility. Up we went and after topping out at about 30 feet the only thing to do was hurl ourselves off the cliff and into the water below. We paddled past a beautiful panel of petroglyphs to other climbing routes. The climbs got progressively more difficult with the hardest moves often being the one out of the water. As the sun began to move lower in the sky we paddled back down stream past a group of young teenagers on top of the cliff. They took turns psyching each other up to make the jump into the water and one by one they made the leap. David and Eric jump after successfully reaching the top of a cliff. David climbs as a boat passes by. David climbs out of the water. Eric climbs a crack above his raft. A beautiful panel of petroglyphs. Mike climbs what he dubbed the “funnest climb ever”. Mike scouts out a line. Mike paddles in a small raft in East Clear Creek to reach the cliffs for climbing.